Since primary (first-line) platinum-based chemotherapy is a potentially curative treatment in conjunction with a debulking surgery for newly diagnosed ovarian cancer, it is important to explore these options with all patients regardless of age. Careful consideration of the dosing and scheduling of chemotherapy is required in our older patients. Although few prospective trials dedicated to older patients with newly diagnosed ovarian cancer have been performed, there have been several papers outlining outcomes and options for older patients. In this chapter, we will review the current guidelines and evidence for various intravenous and intraperitoneal chemotherapy regimens. Glasgow MA, Yu H, Rutherford TJ, et al. 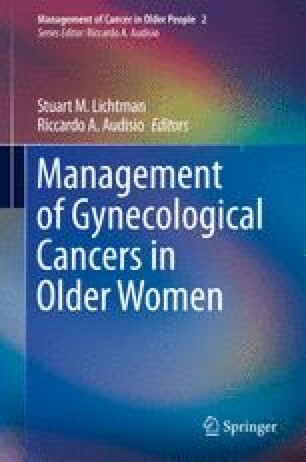 Neoadjuvant chemotherapy is an effective way of managing women with advanced stage ovarian cancer (FIGO stage IIIC and IV). J Surg Oncol. 2012. doi: 10.1002/jso.23171.